I create and conduct civil wedding, renewal of vows, commitment and naming ceremonies at different venues all over Australia. I am often booked for peak season dates 12-18 months in advance. The perfect blend of relaxed humour and professional attention to detail. $200 deposit and remaining fee 14 days before the ceremony. I became registered by the Attorney-General's Department in 2008. Most of my couples book me 12-18 months prior to their wedding day. I take the time to listen and craft a personalised and relaxed ceremony experience for all couples. 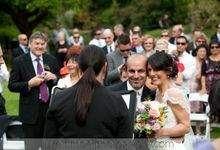 Personalised, modern and relaxed wedding ceremonies are my speciality and I love what I do. I conduct ceremonies all over Adelaide, McLaren Vale and the Adelaide Hills, but am happy to travel to the Barossa Valley, Kangaroo Island, the Whitsundays and other gorgeous locations too. With over 7 years experience as a civil marriage celebrant, I have worked hard to develop and refine my extensive online ceremony resources to make the planning process easy for you.